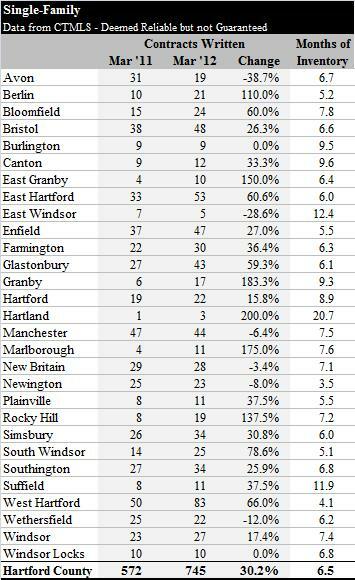 Single-family homes in Hartford County continued to be snapped up in March. The month continued the very strong pace from January and February, with a 30% increase in the number of homes that went under contract compared to March 2011. The month was only slightly behind the tax credit fueled binge that we experienced in March of 2010. Each town is a little bit different, but the hot towns are super hot. 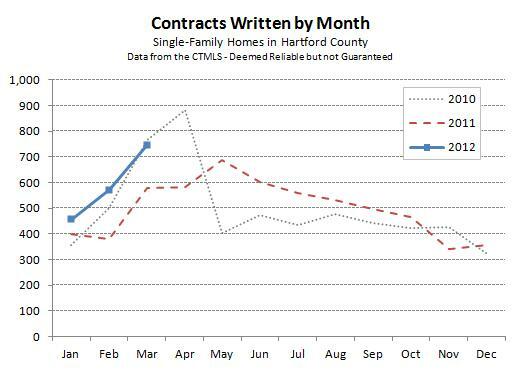 Just look at the chart below, 83 homes went under contract in West Hartford in March! Seriously, 83? That deserves a closer look in another post. A lack of good inventory is still the biggest challenge buyers face. We are seeing multiple offer situations on a regular basis for properties in good condition. Some price points have almost no “good” properties for sale, which only feeds the frenzy when something attractive is listed. Buyers are on the prowl and are not afraid to bid early, and bid high, when a home hits the market. Homeowners in the more active towns have a real opportunity to sell their home – buyers are poised to bid. If sellers take the time to get the property in show condition, if they market the home appropriately, and if they price it competitively, then they should be able to take advantage of the environment. Buyers need to have their act together. Desirable properties are moving more quickly than the average internet-researching buyer is able to follow. By the time they see a listing on their preferred website, it may be too late. It is possible for individual buyers to track the market in nearly real-time, but it takes time and may be easier to work with a good agent. Some of the market activity is likely attributable to pent up demand. The real estate markets saw a prolonged dip in the number of transactions over the past few years. So it stands to reason that some (many?) put their real estate plans on hold until they felt more comfortable with their personal situation. The employment picture now seems stable, and the stock market has come back strongly, so this is the year for many to buy that first/larger home. Everyone has different reasons for why they are interested in real estate. What we can see in the data right now is that many more people are interested in buying a home than we have seen since the first half of 2010.